Did you know that Montreal offers the best and most diverse dining experience over any other city in the World! There are 4942 restaurants in the city of Montreal, which consist of 80 different types of national and regional cuisines. As our guest at Montreal VIP, we have a special treat for you. When you travel with us we can offer you 25-50% off table d'hote or a la carte dining to hundreds of the city's best restaurants. We'll also make all the necessary reservations for you. See below for a partial list of our partners. Web site design by CHAKRAS Inc.
Want to know where the best montreal dining and montreal eating is? Use our service and be a VIP. Whether it's montreal fine dining or montreal fine restaurants and montreal cuisine, we'll take you to the best places to make your montreal outing memorable. Montreal provides enthusiasts with a culinary treat. Montreal ethnic food is rich and diversity and of the highest standards. Montreal Asian food includes Montreal Chinese food and montreal Thai and montreal Japanese or montreal sushi. Mediterranean food includes montreal Greek food and montreal Italian food. There are also many montreal vegetarian restaurants. 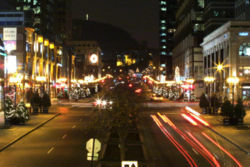 Check out the best montreal steak houses, montreal Newtown and montreal queux de cheval. Great montreal food and montreal meals through VIP. Enjoy montreal a la carte, look up our montreal restaurants list including montreal fast food.